Sun Vegas Online Casino makes its debut in South Africa. Vegas Partner Lounge, the holding company of Sun Vegas Online Casino has recently celebrated one of the group's biggest milestones yet with the launch of Sun Vegas Online Casino in South Africa. As Sun Vegas Casino sets to provide players from South Africa with the same quality that thousand of other players from across the world have become accustomed to, Sun Vegas Casino cannot wait to embark on the journey that lies ahead. "We're absolutely ecstatic about launching Sun Vegas Online Casino in South Africa" exclaims Austin Green, the manager of Sun Vegas Casino. Sun Vegas Online Casino has recently added South Africa to its list of clientele with the launch of Sun Vegas Online Casino in South Africa. With a growing demand for more online entertainment in South Africa, Sun Vegas Online Casino has joined the pack after recognizing a unique opportunity for the casino to reach these players. "Sun Vegas Casino has arrived in sunny South Africa, and we're ready to make it even sunnier for our South African players" explains Austin Green. Previous to the launch of Sun Vegas Casino in South Africa, the casino recently also launched a new look website! The casino's website was refurbished in order to capture the fiery personality of the casino and its atmosphere. "Sun Vegas has long been part of Vegas Partner Lounge, a pioneer for many great casinos, and we really wanted the casino's look to be just as exciting as when you play here" exclaims Austin Green. Elements that were focused on during the process were the usability, functionality and theme of the website. When the design team of Sun Vegas Casino got together, many different ideas were explored with the aim of highlighting the fun, vibrancy and exhilaration of the casino and its people. 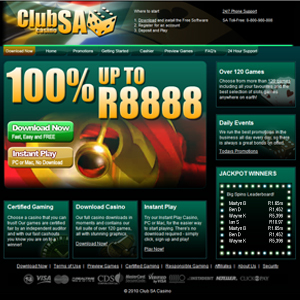 The above mentioned process added much to the launch of the Sun Vegas Online Casino in South Africa. Not only has Sun Vegas Casino launched a new casino, but also a new look website through which players can play on games, such as Online Slots, Blackjack, Roulette, Keno and other top progressive jackpots. According to Austin Green "each player is bound to find a favorite in our over 250 games" and can start their venture with R1000 free & 60 minutes to play when downloading the free casino software.